The Fake Fictions' own story is this: Nick Ammerman and Sarah Johnson (now married) first met when both were involved with WCWM, the radio station at the College of William and Mary in Williamsburg, Virginia. Having played in bands both separately and together, the two didn't waste any time trying to get one together after arriving in Chicago in 2004. Through Craigslist, they found drummer Ben Bilow and the trio quickly got to work with playing around town; and, by year's end, had already released their debut album Fact Friction. 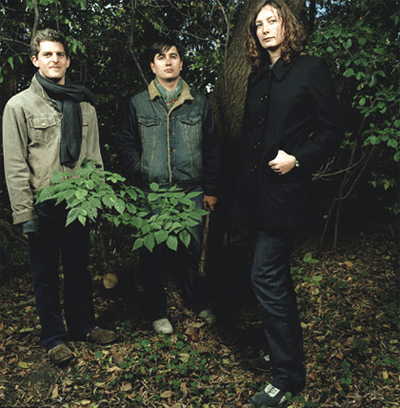 With the release of their Experimental Cheerleading EP the following year, the band started to gain attention and the beginnings of a fan base; and their sophomore album Raw Yang generated enough enthusiasm to land them a spot on the roster for the 2006 CMJ Music Conference in New York. Each of these records defined what was, at the time, the characteristic Fake Fictions style: hooks-based pop songs, banged out with punky exuberance on guitar, bass, drum, and a little bit of keyboards; with Nick and Sarah trading off on the vocals, spinning narratives and observations that were always charming, joyous, occasionally bitter-sweet, and often hilariously clever. 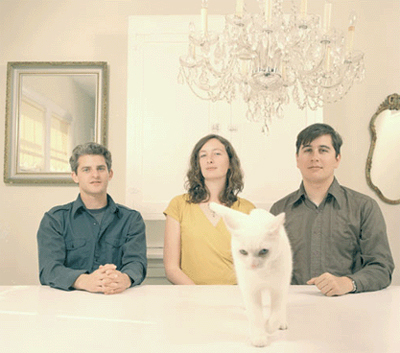 The band's new album, Krakatoa, is out on April 18 on local label Comptroller Records. Nick and Sarah still take turns on the lyrics and the songs are still energetic, fun, and witty. But the one thing that'll strike those familiar with the Fake Fictions' prior records right off is how much less minimal and jangly, how much more loud, rollicking, and raucous the band sounds. As anyone who's seen them perform around Chicago can attest, this cutting loose in a more raw, free-swinging garage-ish mode suits the band just fine. 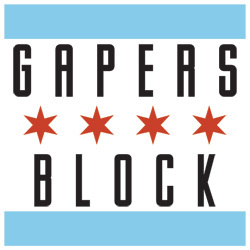 On a recent sunny Sunday afternoon, The Fake Fictions sat down to talk to Gapers Block: Transmission over a pre-practice meal at Handlebar in Wicker Park to discuss their recent activities, the new album, the use of literary devices in pop songs, and what it all has to do with some stuff that's happened to them. 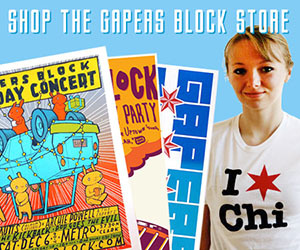 GAPERS BLOCK: First off, the new albums rips a little harder than I was expecting. NICK: Lately there's been something of a shift in the band. I think that comes from playing live, where we feel a lot more free to be obnoxious, and I have a lot of fun doing that. So yeah, a lot of the point of the new album was to go for a stripped-down version of our live sound. GB: I'd wondered if that was because you'd missed playing noisier material as you had in some of your previous bands, or if that came from letting yourselves get more "live" in the studio. NICK: There wasn't any discussion how to go about it or anything. I think it all started with the song "(I Cannot Get Any) Satisfaction," which starts out with a full minute of guitar solos — which is pretty ridiculous and stupid in a way, but we decided, "Well, let's just keep it." And that sort of became a principle: to just try different things and if we thought it worked, just let it go and do whatever we want. NICK: We were doing everything ourselves. Right down to buying the tapes. GB: Complete DIY mode, then? NICK: Right. Which is an idea that's fallen out of favor a little bit, so it's not as common as it may have once been. But we did everything except the mastering. SARAH: The guy who was mastering it asked us, "I'm hearing some tape-hiss here. Do you want me to clean that up?" NICK: We're like, "No! No!" SARAH: And he wanted to make sure. "Really? All I have to do is press a button to make it go away." GB: You and Sarah trade off on the songs, both with singing and with lyrics. How are the songwriting duties split up between each of you — or how much are they? NICK: Sarah and I still each write our own lyrics. But other ideas for songs — or different parts of songs — are more of a band decision, a lot of times. It's a lot more collaborative now. BEN: Each of us might have an idea for this song of that one, and we bring them to practice, toss them in to see what'll work best. GB: On your website, you say the new album involves a bunch of 'rock songs about volcanoes.' But listening to the Krakatoa, I'm not hearing a lot of songs that actually have to do with volcanoes. NICK: Well, it's not explicitly about volcanoes — it has more to do with a general apocalyptic theme. In the case of the Indonesian island of Krakatoa, it was the largest volcanic eruption in known history. When the volcano exploded people halfway around the world could hear it, and it shot so much ash up into the atmosphere that it changed the global climate. It also caused lots of deaths by drowning because it created gigantic tsunamis. And we wanted to relate that to the bigger picture and how that connects to things of everyday life — to things that occur in people's lives on the smaller scale, things that are all mixed in with going to work everyday and dealing with people and various complications while trying to go about living their own lives. SARAH: It was all sort of inspired by what happened to us, about when our practice space caught on fire. GB: I remember when word went out about the fire that destroyed your studio last spring. How'd you end up dealing with that? BEN: We fixed the things we could and bought some new stuff and kept going. SARAH: We did, but at the time it was just so shocking. We all had this moment where we weren't talking about it but were wondering, "Does this mean we're not going to be a band anymore or play music anymore?" Which is ridiculous, because there's obviously nothing stopping you from playing music. It's just another obstacle you have to figure out how to get around. But at the time it seemed like it's the end of the world, y'know? Or a world, at least. SARAH: From the fire hoses, because they had to blow through the windows. GB: So you effectively lost all of your equipment? NICK: We had to get a bunch of things repaired and cleaned. SARAH: [Chuckles] And it wasn't inexpensive to get it all fixed. GB: What sort of music were you making before Fake Fictions? BEN: I played different instruments in different bands back in Madison. But each band I was in was a pop band of one sort or another. SARAH: It wasn't like either of those. NICK: She was writing all of the '90s alternative angry-girl songs. And I wrote all of the sassy, sarcastic songs. Which is what I still do. SARAH: That reminds me of when I was in this band with my best friend. At one point, we had this really serious talk in her kitchen one time about how famous we wanted to get — just to make sure we were on the same page. [Laughs] And I said I wanted to be in a band that was as famous as The Pixies; because while maybe some people haven't heard of them, they were pretty cool, pretty underground, but really, really good. And she got mad at me because she wanted us to be as big as Smashing Pumpkins — because everybody knew who they were at the time. GB: She was mad at you for thinking too small. SARAH: I know! And I had to tell her, "Oh, you don't want to do that. I mean, don't we want to keep the fun in the band?" 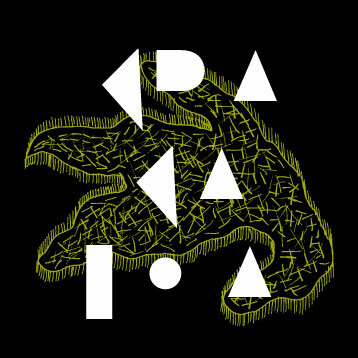 Krakatoa is out this week via Comptroller Records. The band is holding a record release party at the Empty Bottle this Friday evening, April 18, where they'll be playing a supporting set for The Death Set. Vote Regan open, hometown electronic psych-popsters Coltrane Motion follow, the Fake Fictions play third, and Death Set headlines. The show starts at 9:30pm and tickets are $8. Graham Sanford is a writer and editor who lives in Chicago. And, despite what you may have heard, he didn't eat the last of the ice cream sandwiches.